You know the saying, “An apple a day keeps the doctor away”? Well, the phrase originated in 1866 and honestly doesn’t hold any true value. Studies have actually shown that the old proverb, when taken seriously, did however help keep the pharmacist away. Apparently, daily apple eaters were more likely to avoid prescription medication vs. non-apple eaters but it was likely linked to healthier habits in general. Let’s take a look at the fast facts about this great product. This beautiful little veggie capsule can be used to fill in those nutritional gaps. Gentlemen, consider it your apple a day. This vitamin contains essential vitamins, antioxidants and minerals. Also containing Beta Carotene, which is a heart health vitamin. In additions helping to fight high blood pressure, the prostate, macular degeneration, asthma and arthritis symptoms. This men’s multivitamin is focused on the anatomy and nutrient needs of men, geared toward helping them have and maintain a healthy body. Aiding in mental alertness and increased energy. Provided is a 30 day supply, in easy to swallow veggie capsules. Men’s Multivitamin was formulated for the athlete or professional who demands peak performance every day. Vitamin and Mineral Blend– Contains a complete blend of the essential vitamins and minerals needed for good health. Antioxidants– Powerful fruit and berry antioxidants to support great health. Energy Blend– Contains natural energizers from herbs and berries for a natural energy lift with no caffeine. Immune Support– Contains natural immune boosters like Echinacea, Garlic, and Beta Glucan. Natural Energizers– Green Tea, Pomegranate Fruit and other ingredients provide an all-natural energy lift. Our multivitamin can be found under the vitamins and essentials tab at www.impulsetrainingsupplements.com. The ingredients in this veggie capsule may actually help keep the doctor away by providing your body with any vitamins and minerals that you may not be getting enough of from diet alone. Pair it with the Omega 3 supplement that we highlighted last week, and you’ll be feeling pretty darn good. For more information, or if you have any questions, please let us know! Laureen comes to Impulse from Los Angeles. She is an actress/model turned Certified Personal Trainer, Brand Ambassador, and Group Fitness Instructor with a passion for helping people reach health goals and live their best life physically, mentally, and spiritually. 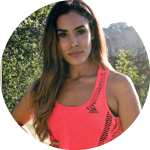 She is the Brand Ambassador for the Impulse Supplement Line and works on creating educational and fun content with the help of the team to teach clients about supplementation and nutrition so that they can fuel their healthy lifestyle. When she is not training, teaching, writing, creating, or being a social butterfly, you’ll find her cuddled up with her dog and a cup of coffee.